Luang Prabang is where I fell in love with Laos. This charming town, located in the northern part of Laos, is a UNESCO World Heritage Site. 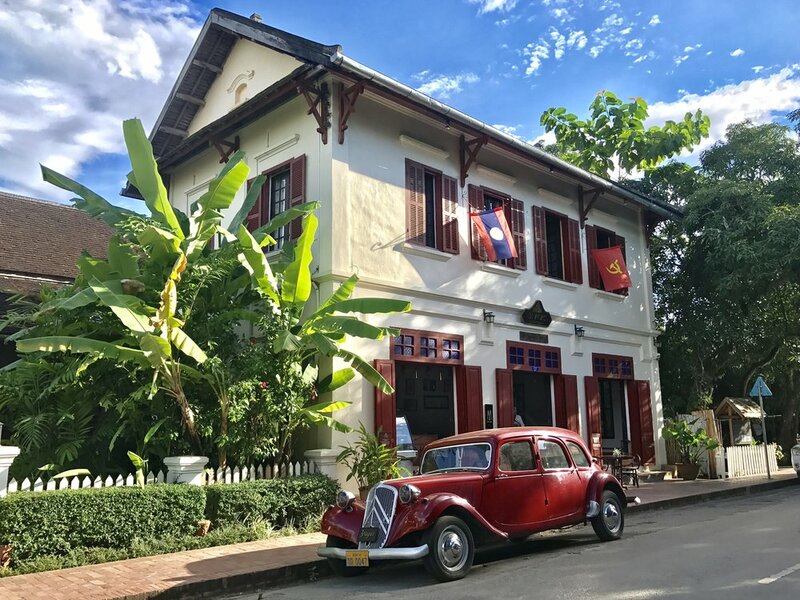 There is a blend of Lao traditional architecture with European colonial style buildings. The streets are filled with restaurants, shops, and temples. After a quick 55-minute flight from Vientiane, we arrived in Luang Prabang. My friends and I had such a great experience using Lao Airlines. I highly recommend Lao Airlines for your travels within Asia. Most accommodations are found in the downtown area. However, we opted for a private villa using Airbnb along the Mekong River just outside of town. If you are a solo traveler, I would recommend staying in town where you have easy access to everything. Our villa included airport pick up, drop off, a daily trip into town, and breakfast. 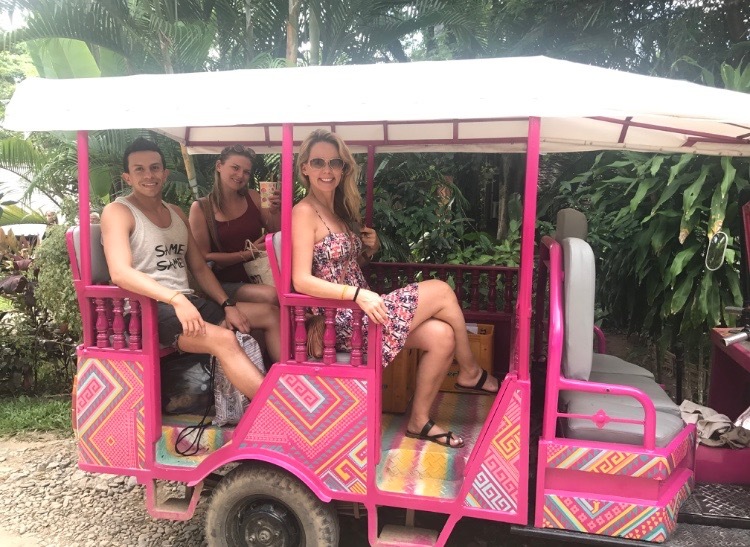 For an additional cost, we had meals prepared for us and excursions organized. I love using Airbnb for my travels. It's super easy to book, typically cheaper than hotels, and you get a feel for how the locals live. If you are new to Airbnb, click here to get a $40 travel credit. We had planned to split the next week between Luang Prabang and Vang Vieng. However, we were having such an incredible time in Luang Prabang that we canceled our travels to Vang Vieng. Here are some of the highlights from the week. Ock Pop Tok Living Crafts Centre is located along the Mekong River just a short drive from the downtown area. They offer weaving and batik classes. 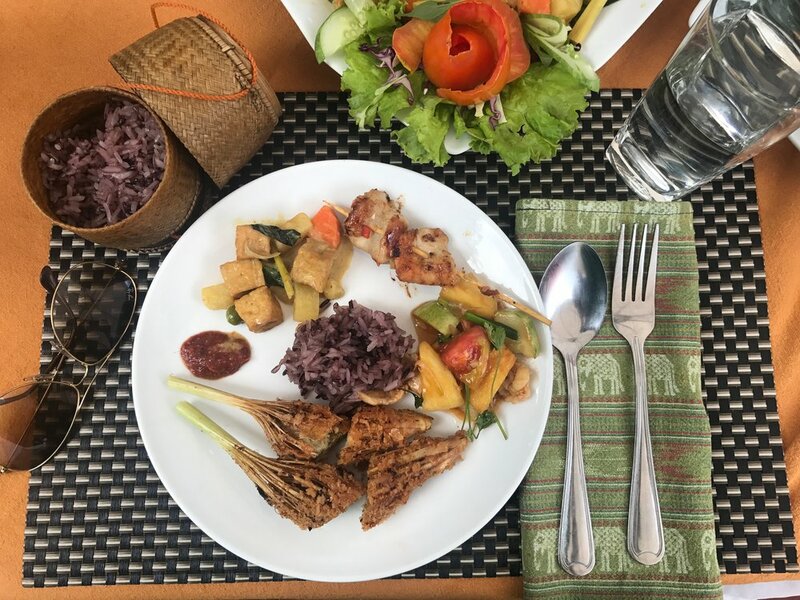 Due to the holiday, we did not have an opportunity to attend a weaving class, but we still enjoyed the stunning grounds and had a delicious lunch at their restaurant Silkroad Café. There are two additional shops and a gallery located downtown. The downtown shop provides a tuk-tuk to and from Living Crafts Centre. Another favorite activity was attending a private cooking class with Bamboo Tree Restaurant. Initially, I was apprehensive because it was 5 hours long. I am a huge fan of taking cooking classes when I visit a new country but wasn't sure if I wanted to spend from 9:00am-2:00pm cooking. Not knowing when I would be back to Laos I decided to go ahead and join the cooking class. I'm so glad I did because this was one of my favorite activities in Luang Prabang. We arrived at the Bamboo Tree Restaurant bright and early at 9:00am and enjoyed a cup of coffee. Upon our arrival, we were given a beautiful cookbook with 31 Lao recipes. Once we picked a handful of recipes to focus on for our cooking class, it was off to the Phosi Market. An essential element of Lao food is its freshness, so a trip to the market was a must. The Phosi market had a colorful display of everything from fresh produce, meat, rice, clothing, and tons of knick-knacks. Once back to Bamboo Tree we were given aprons and chef hats. Linda, the owner of Bamboo Tree, put us directly to work. Linda has years and years of cooking experience and took the time to explain each step. The cooking class was very hands-on, which made it super enjoyable. Before I knew it, we had prepped and cooked five Lao dishes, and it was time to eat. Just before leaving Linda presented us each with a cooking school certificate. Here are a few details about Bamboo Tree Cooking Classes: Morning cooking classes are Tuesday, Thursday, Saturday, and Sunday from 9:00am-2:00pm and include a trip to the market. Evening cooking classes are Wednesday, Thursday, and Friday from 5:00pm-8:00pm and do not include a trip to the market. Vegetarian options are available upon request. The cost of each cooking class is $30 USD. It was well worth every penny. An absolute must for Luang Prabang is Kuang Si Waterfalls. This is by far one of the most beautiful places I've seen in the world. Our Airbnb host was incredibly accommodating and arranged this half-day excursion. After breakfast, a boat picked us up from our villa and we headed out down the Mekong River. An hour or so later we stopped and hopped in the back of a pickup truck. Our driver took us straight to the entrance of Kuang Si Waterfalls. We paid the small entrance fee of about $3 USD and headed into the public park. As we followed the path back to the waterfalls, we passed the Tat Kuang Si Bear Rescue Center. For years, Asiatic Black Bears have been hunted for their bile which is used for traditional medicine. This rescue center has saved bears from poachers and kept them here safely. I could have easily stayed here for hours watching these bears play and roam around, especially the little cubs. We eventually wandered down the path to the falls. From a friend's Instagram post I already had an idea of what to expect, but seeing the waterfalls in person was absolutely breathtaking. Upon seeing the first pool of water, I immediately wanted to strip down to my bikini and jump in the inviting greenish-blue water. We decided to head down the path to more waterfalls. We were fortunate because not too many tourists were there when we arrived. The next couple hours were spent swimming in the water, climbing the waterfalls, splashing around, and snapping endless photos. Honestly, I could have spent an entire day here. We never made it past the first large pool of water, but if you continue down the path, there are more waterfalls to be discovered. After enjoying a snack at the picnic tables, we had to head back and meet our driver. Before hopping in the back of the pick-up, we did some shopping and bought snacks for our journey back to the villa. Lastly, you don't want to miss the night market on Th Sisavangvong Street in front of The Royal Palace. The market is filled with stalls and stalls of vendors selling clothing, lights, blankets, jewelry, scarves, paintings, food, and lots more. We enjoyed roaming the market and purchased Christmas gifts for friends and family back home. My Bestie Lauren + I shopping at the night market.